Meshad, administrative seat of the Khorassan province throughout the centuries, and home of many well known oriental rug workshops in the towns of Amoghli, Khamenei, Makhmalbaf, Saber, and Zarbaf produced antique Perisan rugs that feature both symmetrical and asymmetrical knots. 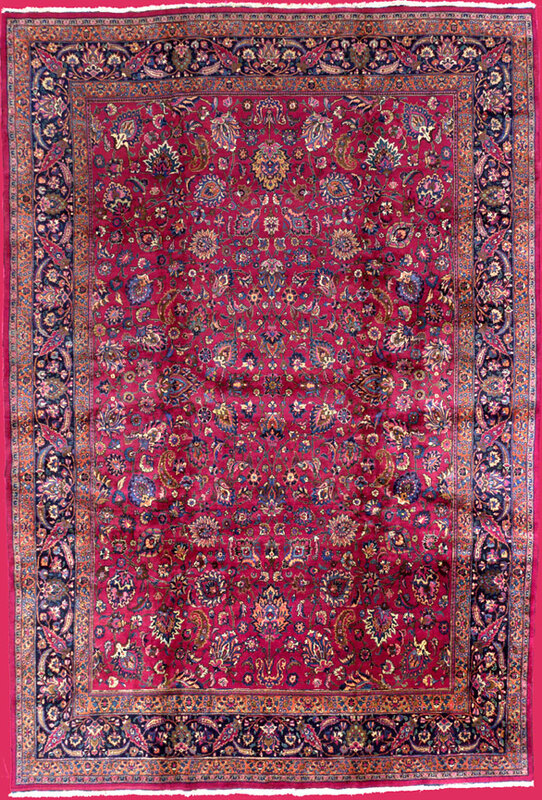 Antique Meshad carpets are ‘jufti’ knotted, a technique used in antique Khorassan carpets and antique Doroksh rugs, and display multiple borders with eclectic color palettes. Designs are based on classical models, but are executed with East Persian spontaneity in color schemes ranging from traditional burgundies and midnight blues, to the more contemporary tints of ice blue and beige. Meshad weavers frequently signed their work, adding interest and value to the precious nature of these antique oriental rugs.